The Sony HXR-MC1 is a unique HD camcorder designed for point of view camera work. Commonly known as a "Crash Cam", the HXR-MC1 is ideal for extreme sports, POV shots, or simply any situation that would otherwise be difficult while using conventional video cameras. 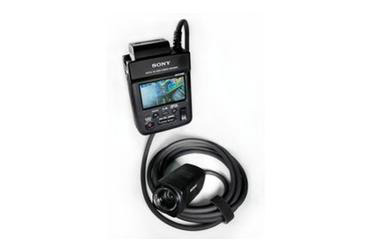 The camera comes equipped with an off-board tethered LCD panel which allows for instant framing and footage review. The camera's housing is splash proof, making it capable of traversing adverse conditions without any problem. The Ultimate "Crash Cam" The HXR-MC1 makes a great POV camera for virtually any extreme situation. Whether it's strapped to the side of a motorcycle or skateboarding around the city, the camera opens up a multiple of shooting options impossible with conventional cameras of its class. Very cool. AVCHD High Definition Recording AVCHD is a variation on interfame codecs such as HDV and XDCAM. The advantage is that it uses a standard H.264 compression algorithm, making it highly efficient without sacrificing large portions of memory. Less bandwidth allows the camera to record directly to inexpensive MemoryStick media. Exmor Inside The camera's chip incorporates Sony's patented Exmor technology, boasting color fidelity and image quality in a variety of lighting situations. ClearVID CMOS Technology Sony's ClearVID sensor is positioned at a 45 degrees angle. Since each pixel is positioned at this angle the result is far clearer diagonal lines. Images will appear crisper, without the apparent "jaggies" that often plague video signals. Flash Memory Recording Storage The HXR-MC1 provides AVCHD video in a number of quality levels. The ability to record up to 16Mb/s onto a single card makes the camera not only incredibly versatile, but allows users to record onto inexpensive media. If longer runtimes are needed, the camera will record at lower bit rates to increase run time per card.